« Leading Up to Lent! Today is August 13, a date that has no special meaning for most people, but has unique importance for Moravians. This is the anniversary of the renewal of the Moravian Church in Herrnhut, Germany in 1727. The church, founded in 1457, had been nearly destroyed by the Thirty Years’ War, and the church was outlawed in Bohemia and Moravia. A small remnant – what Moravian Bishop John Amos Comenius earlier called a “hidden seed” – migrated to the land of a Lutheran noble, Count Nicholas Ludwig von Zinzendorf. Zinzendorf, a unique spiritual genius, permitted the “Herrnhuters” remarkable religious liberty for the day, but with the unfortunate (and perhaps predictable) result that religious excess and controversy exploded in the village. The Count resigned his court position in Dresden to become a noble pastor to the troubled group, visiting and calling the people together for prayerful study of the Scriptures. During this period, the residents became convicted that their behavior toward one another had been inexcusable – that the Savior called His followers to exhibit love toward one another, to be “one” in His name. Out of this grew the remarkable document known in German as the “Bruderlisch Vertrag,” the Brotherly Agreement, now known as the Moravian Covenant for Christian Living. Rather than a doctrinal statement, the Moravians signed a code of Christian behavior. This was signed on May 12, 1727 by all the residents of Herrnhut. A few months later, at a special service of Holy Communion held on Wednesday, August 13, they experienced a powerful sense of the presence of the Holy Spirit – and those who had been divided felt truly one in Christ. This reestablished the ancient call of the Unity – to live out the Great Commandment and the Beatitudes in community in a way that bore witness to the world of the love of God. “By this everyone will know that you are my disciples, if you love one another.” John 13:35, NIV. 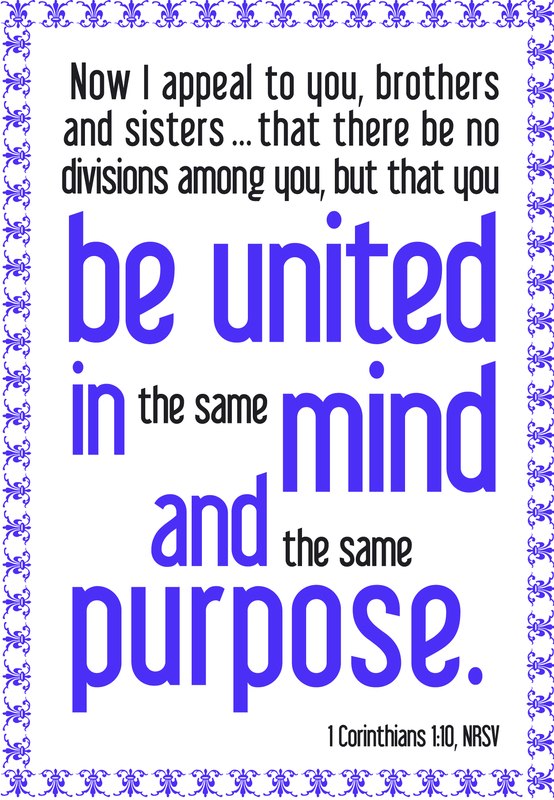 This is a call that the Unity has sought to live out for over 557 years, since our founding in 1457. In a recent online discussion about this, I made the (almost correct) statement that the Moravian Church is the only mainline denomination to have never experienced a schism or split. I was properly corrected by someone who recalled that in the very early days, a group did split off over the issue of whether or not Brethren should swear oaths. That group reunited with the Utraquists, a group that eventually died out. But since that time, for over five centuries, we have worked to preserve Christian unity as a primary virtue and testimony to a religious world that is most often divided and bickering. That testimony is respected out of all proportion to our tiny size by larger denominations, who often seek to learn from us how to achieve what we do. Moravians have been pioneers in the ecumenical movement, calling denominations together in the name of Christ – and as a result, we have twice had Morvian clergy elected to head the World Council of Churches, and twice to head the National Council of Churches in Christ – despite the fact that we are one of the smallest member denominations. So today we are faced with a decision: once again, as has happened in each generation, or probably each decade, we face a divisive issue that threatens to tear our unity apart. We have people who believe that their issue is one that is so important, they must leave the Unity if a vote does not go their way. Some of them want to form an “independent” Moravian Church, something which is really an oxymoron, since it overlooks the central tenet of being a part of the Unity – that is, to be part of the Unity! So once again, our unity is challenged – as it has been so many times before. 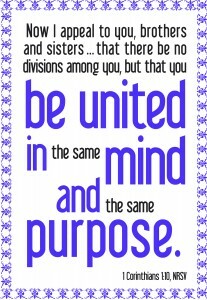 The Unity is a relationship – much like a marriage – which must be nurtured and maintained. Just as in a Christian marriage two people commit to relationship with one another – each also in relationship with the Savior – so too we commit to a relationship with one another, each also in relationship with the Savior. As in a marriage, we must overlook each other’s shortcoming and bear one another’s burdens, so it is in the Unity. We live together as sisters and brothers in Christ, not always agreeing in detail, but always agreeing in love – and seeking to follow the Savior together. We have a choice today – as the Herrnhutters had a choice 287 years ago, and as the founders of the Unity had a choice 270 years before that. As indeed we have had again, again, and again: do we continue to bear witness that we are disciples, known by our love for one another? Or shall our differences consume us so that we break this astounding witness? We have a choice today, just as we will have a choice tomorrow: a choice to continue this witness of unity, or to destroy it and prove to the world that even the Moravians cannot live together in love. Which shall it be? This entry was posted by PastorJohn on August 13, 2014 at 5:57 pm, and is filed under Christian Unity, Faithful Living, Future, Grace, Gratitude, Heritage, History, Tradition. Follow any responses to this post through RSS 2.0. Both comments and pings are currently closed.